Quality, not quantity this week. Michael’s from Canada. That’s why he spells it “colour.” These are Week 2 books, by the way. The Week 3 books are below! 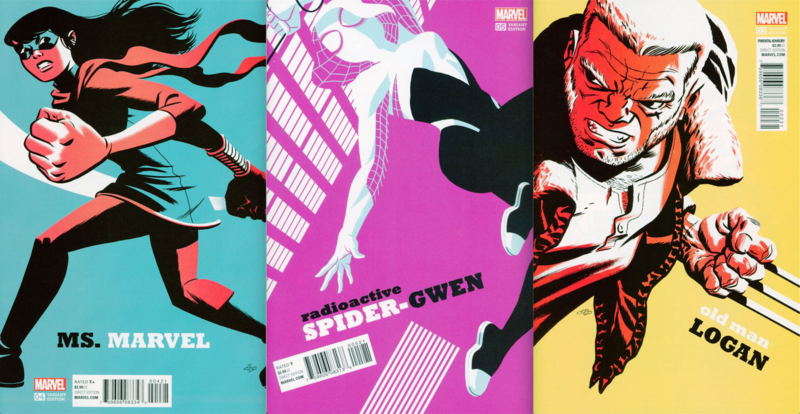 Artist Michael Cho is doing about 20 variants for Marvel this month, melding graphic design and superheroing to produce many a masterpiece. We were so taken with these electric covers that we invited him to do a “director’s commentary” on each, grouped by week of release. 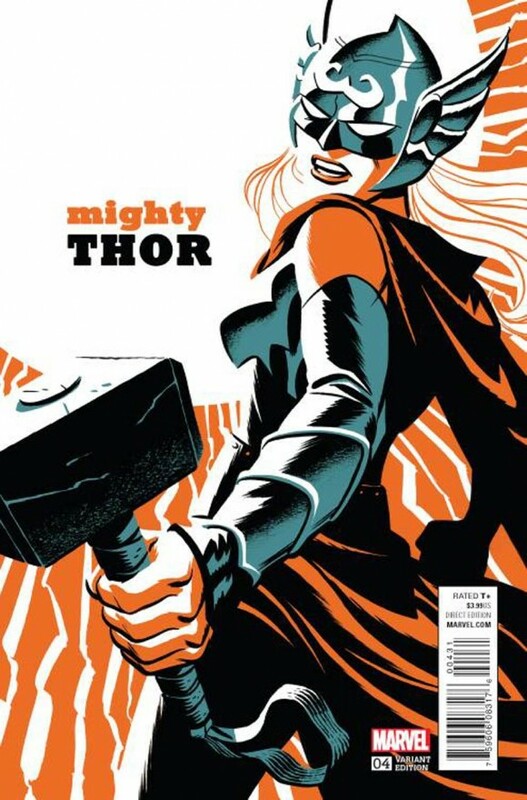 Mighty Thor #4. The original rough that was approved was a little different but I wasn’t very happy with it as it was a pretty weak pose. Also, I realized I had put her arm-sleeve on the wrong arm. The colour balance wasn’t going to work with it removed, so I came up with a different layout and pose at the last minute. The “ball of lightning” effect in the background is a little nod to Walter Simonson — one of my favourite Thor artists (second only to Kirby, of course). 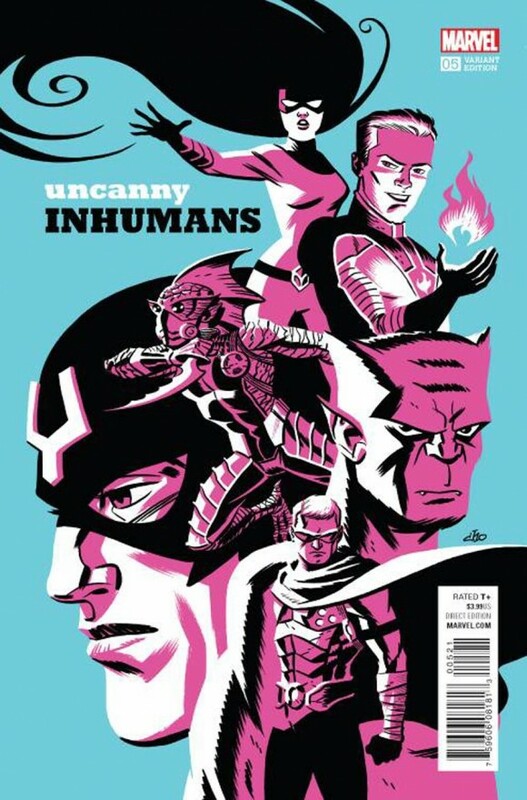 Uncanny Inhumans #5. This one is my idea of a paperback cover — maybe an old sci-fi one from 50 years ago. I’ve enjoyed solving group-shot problems using a montage solution lately. I tried to balance the black shape of Reader’s billowing cape on the bottom, with Medusa’s flowing hair at the top. Beast was the fun one to draw in this piece — I think I made him look a bit like Wally Wood’s Animan here. I was originally disappointed that I didn’t get to draw the Kirby design for Triton, but when I saw his new look, I thought it was really well thought out.